Kurlee Belle: Do you only buy black-owned hair products? Ethnic hair care accounts for a quarter of a billion dollars in annual sales. As a result, there are many black-owned brands and corporate brands targeting the market because of the increased trend of African American/Black women 'going natural'. Larger companies like Procter & Gamble are monitoring our every move and coming up with products for natural hair. 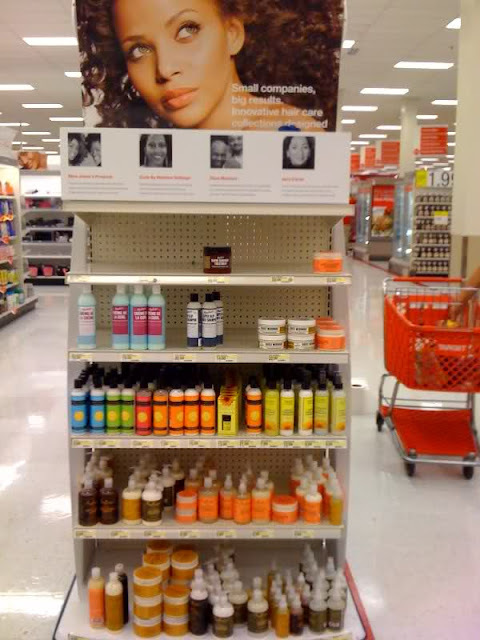 Just a few years ago, there were a limited amount of brands that catered to natural hair. Today there are several black-owned brands like Kurlee Belle, CURLS, Jane Carter Solutions, Carol's Daughter, Mixed Chicks, Shea Moisture and Miss Jessie's which are specially designed for natural hair. "The Threat of Generic Brands: Natural Hair Companies, Black-Business Owners, and the Retail Boom", a Huffington Post article written by Tamika Sayles, highlights the growing trend of generic brands entering the natural hair care niche. Established brands have huge marketing and development budgets, which translates to reaching more people and selling products for less. As a result, these brands saturate the market through the use of commercials, sponsoring events and magazine ads. Essence Magazine which is the bible for most black women has a ton of full page ads targeting the natural hair community. The cost of a full page ad in Essence is around $101,700 (Essence Media Kit). This exorbitant amount is considered "chump change" to corporate brands and smaller brands cannot compete. Corporate brands not only dominate the marketing arena but have the ability to counterfeit the idea of smaller brands. For instance, Mixed Chicks is currently in litigation with Sally's Beauty Supply Store, in which Sally's created Mixed Silk, a product similar to the Mixed Chicks conditioner. If Mixed Chicks loses the case, they will be liable for damage caused to Sally's as a result of the accusation. In my opinion, black-owned brands have a sense of loyalty to their customers. Most importantly, these brands identify with the needs of the consumer because they are the consumer. For instance, I have been working on Kurlee Belle products since April of 2010. During the process, I've rigorously tested the products on my hair to ensure that they truly work. As a woman, with natural hair I know how I want my hair to feel and look and it is important to me that my products do just that. Kurlee Belle products will be released this summer and it is my guarantee that what is stated on label will be true of the contents in the bottle. Corporate brands are not concerned about the consumer, but rather their bottom line i.e. how cheap they can produce the product to make a profit. Furthermore, they are even less concerned about the chemicals they put in products and the harm it does to consumers. Don't believe me? Read this article I wrote awhile back on a lady that went into a coma after using L'Oreal Preference hair dye (Why Some Hair Dyes Can Land you in a Coma...). An added benefit of supporting black-owned brands is the real human connection you get. My goal is to be available to my customers by interacting with them through this blog, meet ups, facebook, twitter, etc. If you have a question, I am here to answer with no red tape. The bigger brands usually have a brand manager who is rarely of ethnic descent but is skilled in the art of marketing and understanding consumer needs. Do you want to be manipulated into buying a product just because you fit the demographic that watch a certain show or read a certain magazine? No, right? You want products that were made for you, by people like you, that actually work. The American Health & Beauty Aid Institute developed the "Proud Lady" which is a symbol used on the back of products to identify black-owned companies. Do you prefer to buy black-owned hair products? Yes, I do, but some of the black owned hair products are sooo expensive I presume because of limited stock, man-power, etc. I can understand that but if I am to buy such an expensive product and pay shipping and handling it MUST work for my hair type. I AGREE that the black owned products are always too expensive, why not use drug store products that offer the same thing for a lower price ALSO many black owned products have harmful ingrediants but many do not as well. It is easier to find safer AND cheaper products by just picking up that $2 "Suave naturals" compared to $10 for Shea Moisture or $15 for Miss jessies etc. I support both but man we have to stop being so expensive because many people would love to support our black business but they are so expensive not saying any other products are not because some others are expensive too! These are incredible, I usually hate when people do tutorials inspired by stuff like this or princesses or what have you because I don't think they ever remind me ANYTHING of the character it's suppose to represent, HOWEVER, these are PERFECT. Every last one. I agree, I want to buy from my own peps, buyt they are always the most expenisve. I try using natural products instead.